U.S. President Barack Obama said in his weekly Saturday address "no terrorist group has yet succeeded in obtaining a nuclear device or producing a dirty bomb using radioactive materials," but al-Qaida has tried. The president delivered his address from the Nuclear Security Summit where world leaders gathered to discuss what Obama described as "one of the greatest threats to global security - terrorists getting their hands on a weapon of mass destruction." Obama says Friday that global efforts to stop terrorists and others from using nuclear weapons are by "no means finished." Obama wrapped up the Nuclear Security Summit in Washington by saying world leaders had made "significant and meaningful" progress over the last six years in securing stockpiles of nuclear material. Obama said enough material to build 150 weapons was now safe from terrorists. But he said nuclear arsenals in some countries were expanding and stocks of plutonium were growing. Obama said he and the more than 50 other world leaders in Washington agreed to further strengthen nuclear facilities from cyberattacks and improve intelligence sharing to continue to make sure dangerous materials stay out of the hands of terror groups, such as Islamic State. The president noted that more than a dozen nations had disposed of their entire supplies of highly enriched uranium and plutonium — the radioactive elements necessary to build nuclear bombs. During six years of international meetings on nuclear security — including four summits, which he initiated — the U.S. president said, "We’ve embraced a new type of thinking and a new type of action." Obama also met with a smaller gathering of the nations most closely involved in last year's nuclear agreement with Iran. He told the so-called P5+1 group the deal with Iran had "achieved a substantial success and focused on the dangers of nuclear proliferation in a real way." He stressed, however, that "full and continued implementation" of the Iran agreement would "take the same level of cooperation" from the international community. This year's nuclear security summit has come at a time of heightened concern about the possibility that Islamic State militants could acquire nuclear materials to build "dirty bombs" that could spread deadly radioactive fallout over wide areas. North Korea's nuclear-weapons development program also has been closely studied. Obama said the scores of nations working together on nuclear security have made "260 specific commitments to improve nuclear security," both at this year's summit and their previous sessions. “Once again, I am making it clear that the United States will do our part," Obama added. "Today we’re releasing a detailed description of the measures that our military takes to protect nuclear materials, so that other nations can improve their security and transparency as well. "For the first time in a decade we are providing a public inventory of our stockpiles of our highly enriched uranium. ... And that inventory is one that we have reduced considerably." Obama has met with leaders from South Korea and Japan on the sidelines of the summit about their mutual concerns over North Korea's provocative gestures and actions. Although there was no specific response from Pyongyang to the trilateral meeting or to Obama's separate private meeting Thursday with Chinese President Xi Jinping, the North Korean military launched another small ballistic missile into the sea early Friday, officially announced it is blocking popular Western websites and stepped up jamming of global-positioning data beamed to Earth by a network of satellites. In Geneva, moreover, a top North Korean envoy told Reuters that Pyongyang intends to pursue its nuclear and ballistic missile program in the face of repeated warnings from the United States and other nations. During the U.S. president's meeting with Xi, U.S. officials reported the Chinese leader said: "We want to enhance communication and coordination on the Korean nuclear issue and other regional and global issues." Washington views Beijing, Pyongyang's ally, as key in enforcing U.N. sanctions against North Korea for its weapons development. While some nuclear proliferation experts expressed optimism over China's verbal commitments to keeping the regime of Kim Jong Un in check, they also said China needs to safeguard its own growing nuclear capabilities. "The United States is very grateful that China is participating," said Debra Decker of the Washington-based Stimson Center. "China is going to be a leader in the international world market for power reactors, and they may be, probably in the next 10 years, the largest possessor of nuclear power reactors. "If China wants to go forward and say they have the best power plants and [wishes] to export them," they need to prove that they can adhere to baseline nuclear safety protocols, she added. Robert Gallucci, the State Department's former North Korean nuclear envoy, said both nuclear and non-nuclear states in China's neighborhood have the potential to increase development capacity, and that summit attendees should pay particularly close attention to the regional proliferation of plutonium. Franklin Miller, former National Security Council Senior Director for Defense Policy and Arms Control, said China is not interested in that dialogue. “There has been a clear reluctance on the Chinese behalf to talk," he said. "We need to factor these issues into our strategic discussions, [but] our Russian and Chinese colleagues have been less than I would say enthusiastic about engaging in those types of discussions." The possibility of nuclear terrorism was also a key focus on Thursday, the first day of the summit. 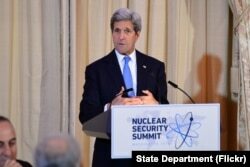 U.S. Secretary of State John Kerry delivers remarks at a working dinner that he co-hosted with U.S. Energy Secretary Dr. Ernest Moniz for the 2016 Nuclear Security Summit at the U.S. Department of State in Washington, D.C., on March 31, 2016. At a State Department ministerial level dinner, Secretary of State John Kerry said there have been times when nuclear security progress has been slow, and there remains an “enormous amount more to do. But every step forward that we take is a step away from danger." The U.S. and other world powers may be experiencing a heightened sense of urgency in securing nuclear material and sites from terrorists following the March 22 attacks in Brussels. News reports say two brothers linked to the attacks were part of a plot to gain information about a Belgian nuclear facility. "We know that terrorist organizations have the desire to get access to these raw materials and their desire to have a nuclear device," said White House foreign policy aide Ben Rhodes. One U.S. lawmaker, Congressman Ed Royce, chairman of the House Foreign Affairs Committee, said, "We should assume terrorists will continue to seek out the weakest links at nuclear facilities around the globe." World leaders also are concerned about the security of nuclear materials and facilities in countries such as nuclear armed Pakistan, where a terrorist attack in Lahore on Easter Sunday killed more than 70 people. While progress has been made since the first summit in 2010, "the overall objective of securing the most vulnerable nuclear materials in four years …I don't think has been achieved," said Sharon Squassoni with the Center for Strategic and International Studies. "There is still material out there and the material that we're talking about is highly enriched uranium," she said. Experts say security gaps remain for several reasons: there still is no international framework to monitor nuclear materials; some countries are unwilling to open up supplies intended for commercial use, and some militaries have been unable to agree on how to deal with their nuclear material. "If you wanted to cause a nuclear incident, you might look for the country with the most vulnerable reactors," said James Andrew Lewis, head of the Strategic Technologies Program at the Center for Strategic and International Studies. As the summit got under way, the White House released a statement saying the U.S. has declassified and released data on the national inventory of highly enriched uranium. It said inventories decreased from about 741 to 586 metric tons between 1996 and 2013. VOA White House correspondent Mary Alice Salinas, Katherine Gypson and Li Bao of VOA's Mandarin Service contributed to this report.